For those who are celebrating, Happy Lunar New Year! Wishing happiness and prosperity to you all. This is the year of the snake. Similar to Western astrology, the lunar calendar is represented by 12 different zodiac animal signs, though they are assigned years rather than months. The Lunar New Year is celebrated in various parts of Asia, with different traditions and food. I am most familiar with the Chinese and Taiwanese traditions. Unlike in the U.S., where the New Year is celebrated with just a single day, for the Chinese, the Chinese New Year spans 15 days. The days leading up to the holiday involve a lot of work. Homes are usually thoroughly cleaned. Floors are scrubbed, walls are repainted, etc. The idea is to sweep away misfortune and make room for incoming good luck. Usually a lot of food is prepared as well, ending with a very large feast on New Year’s Eve. No cooking is supposed to be done on New Year’s Day. On the first day of the holiday, there are usually fireworks (originally to scare off evil spirits), as well as gathering of close family members. Children pay respect to their elders and wish them a happy new year and are usually rewarded with red envelopes filled with cash. As a child, this was my favorite tradition! In Taiwan, businesses usually are expected to give out red envelope bonuses to their employees as well. Chinese culture has great belief in symbolism and there are various dishes eaten to bring good luck for the New Year. One of the traditional dishes eaten during the New Year is a New Year Cake. It’s a very simple steamed cake, made with glutinous rice flour for a mochi-like chewy texture and sweetened with brown sugar. The name literally translates as “year cake.” It is supposed to be good luck to eat it because the cake name is a homonym for “higher year.” Thus, the belief is if you consume the cake, you will have a successful upcoming year. 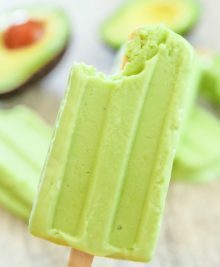 I always eat it simply because I love it, especially with its chewy texture. Another tradition includes making homemade dumplings. The dumplings resemble the shape of ancient Chinese money, and are supposed to bring fortune. In the past, I’ve made homemade dumplings for New Year’s Day, but it’s more fun when there’s a large group. 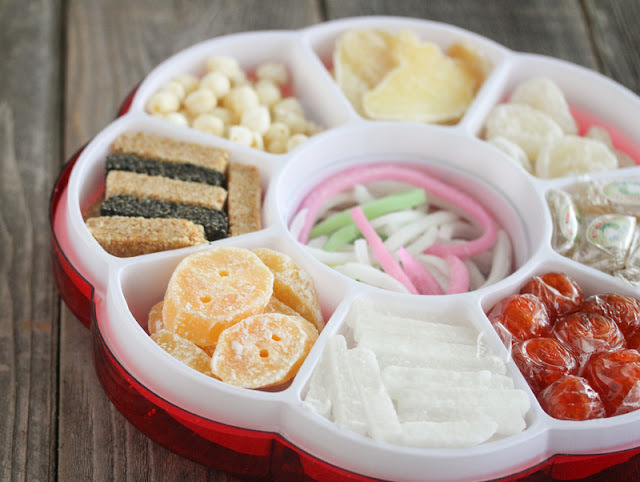 There are also various candies eaten during the holiday. 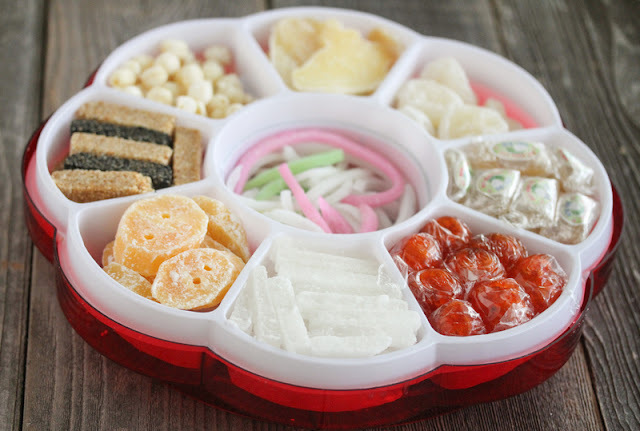 The sweets usually consist of candied and preserved versions of various popular Chinese vegetables and fruits like winter melon, lotus root, sweet potatoes, persimmons, water chestnuts, coconut flakes and ginger. My favorite is the winter melon which actually has a “winter fresh” sensation when you bite in, which you only experience in the candied form. On the 15th and final day (which usually ends near Valentine’s Day. This year it ends exactly on Valentine’s Day), sweet rice balls are usually made and eaten. 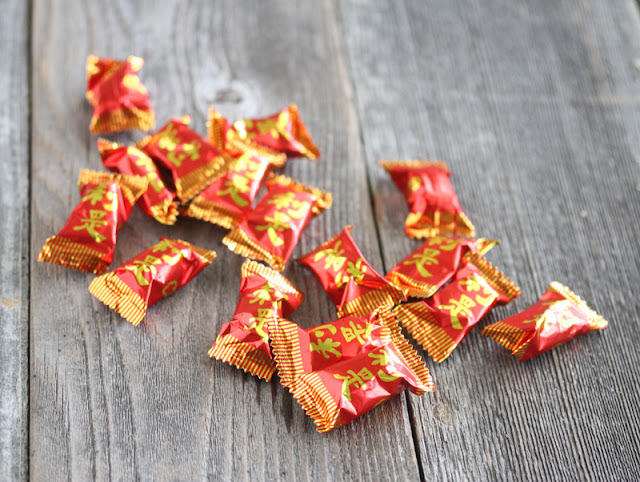 Interestingly, this sweet is also always one of the required dishes for a Chinese wedding. Happy Lunar New Year to you, too, Kirbie. I’ve always heard how the new year is a big holiday in Asia, and maybe one of these days, I’ll get to see it. Now that you’re married, *you* must give out lucky money! So far I haven’t had to yet because we don’t have any young nephew, nieces, etc yet. Haha! Yes it’s so different in Asia. I only got to experience it once, but it was so fun. Normally when I visit Taiwan, everyone is working or in school. Even on weekends they have to work overtime and my cousins always had to do prep classes after school and on weekend. But during Chinese New Year, no one worked. It was so strange seeing everyone home and with free time and we just hung out and played. This post really has me missing SoCal. So much more diverse and I miss that little Hello Kitty & Friends store in Long Beach. At least the rice candies are easily found here in CO.! Aw. I’m glad you can find the rice candies. There’s a lot of HK stuff you can buy online through ebay or some of the LA stores, you can order online. The New Year’s cake is one of my favorites. 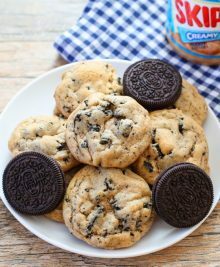 I didn’t realize how unhealthy it was until I made it myself. It is literally flour and white or brown sugar! Must be why it takes so good! Haha, yeah. It’s good in moderation though! Gong xi fa czi, Kirbie! I received 2 gigantic steamed rice cakes for frying a week ago. I’m only half way through eating the first one. There’s just so much fried rice cakes I can eat. I really wanted to make some mini ones and gift them and then I ran out of time. Then I was just doing to make one for us, but I would be eating the entire cake by myself which isn’t very healthy. So I ended up buying a tiny one from Ranch. haha. 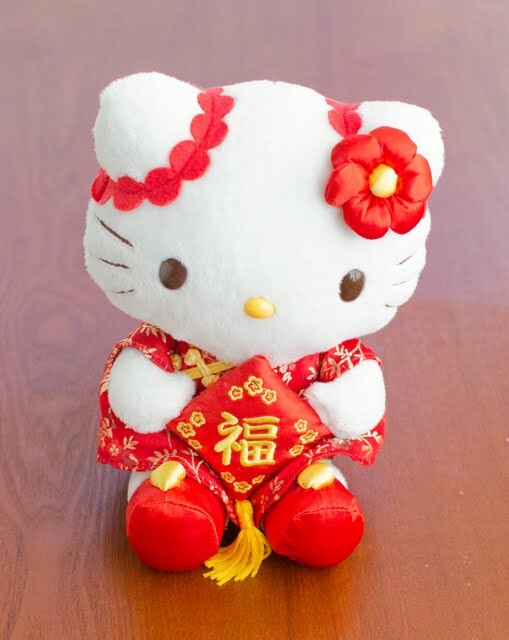 Gong Hei Fat Choy!!! Wish you good health, good fortune and happiness! Happy new year, Kirbie & DH! Thanks! Happy New year to you & S!